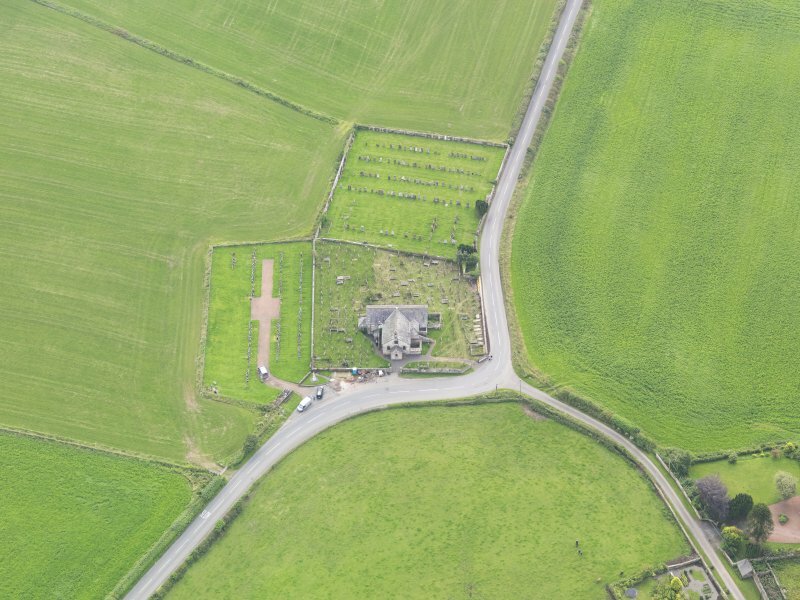 Oblique aerial view of Kirkpatrick Fleming Parish Church, taken from the NNW. 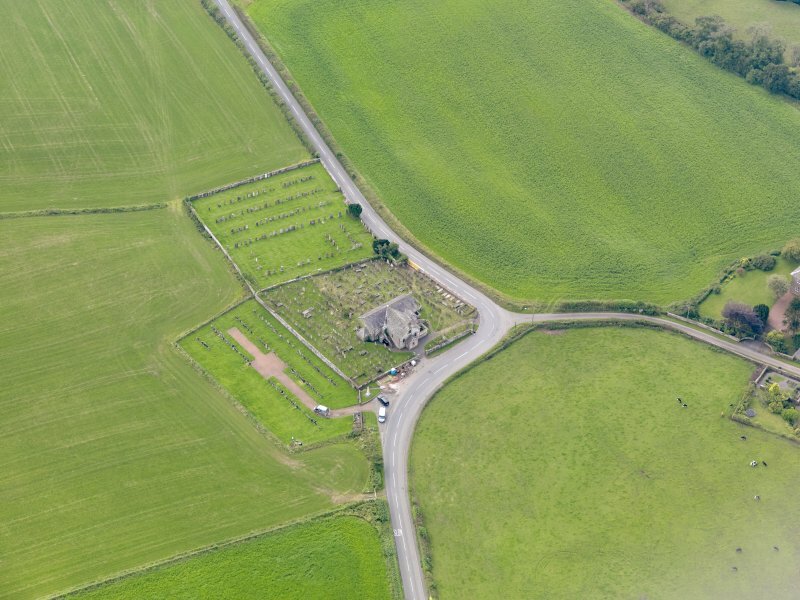 Oblique aerial view of Kirkpatrick Fleming Parish Church, taken from the NNE. 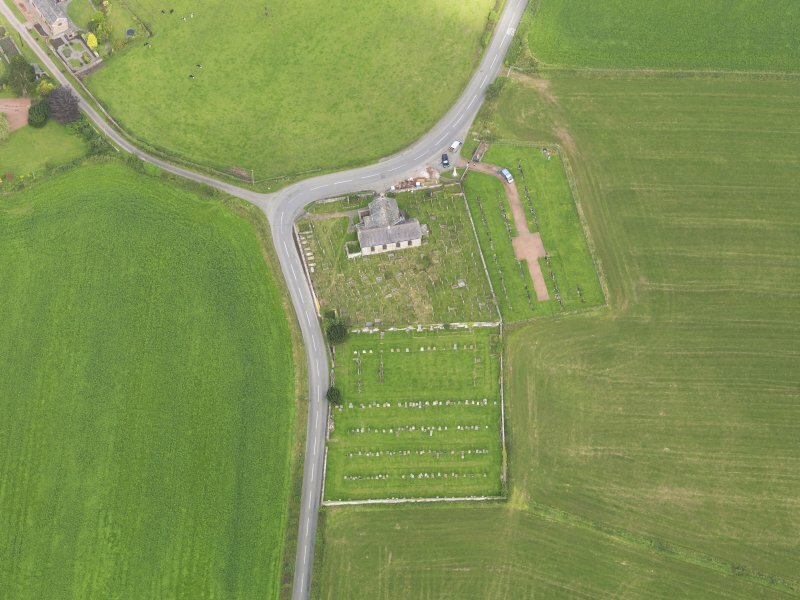 Oblique aerial view of Kirkpatrick Fleming Parish Church, taken from the S.
Oblique aerial view of Kirkpatrick Fleming Parish Church, taken from the E.
Detail of consecration cross built into W wall. For medieval crosses and sculptured stones probably derived from this church and now set into buildings at Kirkpatrick House (formerly the manse of Kirkpatrick-Fleming), see NY27SE 31.00. For (present) Kirkpatrick-Fleming manse (NY 2744 7035), see NY27SE 41. The church of Kirkpatrick Fleming was dedicated to St Patrick, and the name Fleming was given to the parish from the family of Fleming of Redhall, to which the most part of the land here long pertained. There was also a chapel at Logan and also in the parish a Well of St Helen. The parishes of Kirkconnel (NY27NE 1.00) and Irving were united with Kirkpatrick Fleming on 24th June 1609 and in 1609, respectively. Church: Built 1735, partly rebuilt 1778. Later additions. Kirkpatrick-Fleming parish church was 'partly rebuilt' about 1857, but had again fallen into disrepair by 1834, when the construction of a new church was under consideration. R C Reid and W F Cormack 1961. Kirkpatrick-Fleming (Glasgow, Annandale). Also known as Kirkpatrick Juxta Gretna, the church was granted to Guisborough by Robert de Brus c. 1170 and confirmed to the priory by his son William (1191x1215). Successive disputes took place over the church between the canons and the bishops of Glasgow to whom the patronage was ceded in 1223, while the 'parsons' received increased emoluments. The church was still connected with the priory in 1330, but thereafter it resumed the status of an independent parsonage within the patronage of the bishops of Glasgow. 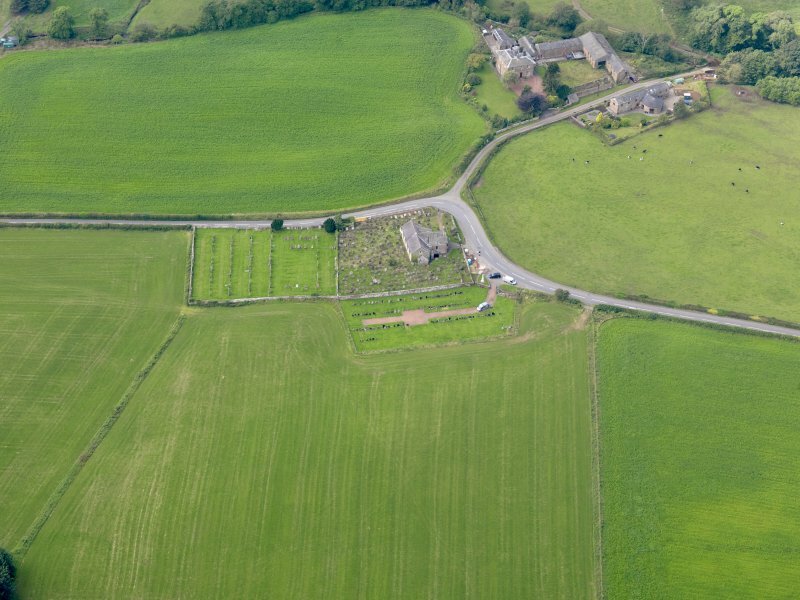 The medieval parish church of Kirkpatrick-Fleming occupied an eminence to the SE of the present village and probably stood on much the same site as the present parish church. Within the burial-ground, on the S side of the present building, there is a terrace which measures about 10m by 5m overall and has the appearance of a building-stance. At the foot of the W wall within the Graham burial-aisle (a fine example of 18th-century polite architecture situated at the W end of the present church) there is a consecration cross which is probably of medieval date and is similar to another (NY27SE 31.02) preserved in an outbuilding to the manse. Within the aisle, there are two 17th-century recumbent slabs with inscriptions carved in false relief, while, within the burial-ground itself, there are a number of 18th-century gravestones. Visited by RCAHMS (IMS, PC), 29 August 1993. Kirkpatrick-Fleming parish church. T-plan kirk of snecked rubble. The body may well incorporate medieval walling, but the church was enlarged, probably including the addition of the N jamb, in 1726, when the roof's heather thatch was replaced by slates; partial rebuilding took place c. 1775. Round-arched windows, those in the S front with projecting imposts and keystones. They all look to be of c. 1775 as do the ball finials on the E and W gables. On the gable of the jamb, a tall birdcage bellcote of 1733. In the inner angles, gallery forestairs and porches, perhaps added in John B Leslie's alterations of 1892-3. Certainly of 1892-3 are the E vestry, the bargeboards and red-tiled roof ridge. W porch added in 1911. Built against the N jamb is the Irvings' burial enclosure, probably of the earlier 18th cent. V-jointed ashlar base; panelled superstructure with pilasters supporting the cornice. Moulded door surround, its lintel carved with a skull and crossbones. Against the W gable, the burial enclosure of the Grahams of Mossknowe, dated 1678 (?). Rusticated quoins; on top, a balustrade with ball finials on the corners. Inscription panel over the moulded entrance. Fair number of 18th century headstones, decorated with heraldry and reminders of death. Among them, S of the church, the stone commemorating John Armstrong (died 1701), the pedimented front carved with a pair of hands. Headstone to John and James Lam (died 1748 and 1752, both in infancy) embellished with the relief of two children standing above a pair of coffins. 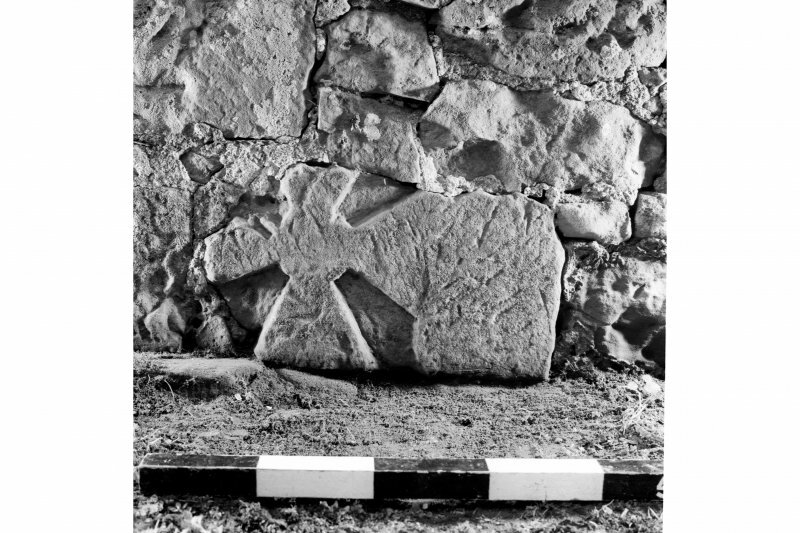 Listed as church, burial-ground and medieval wedge-armed cross.